BSNL : Chairman Anupam Shrivastava announced that all facilities of the AAdhar will be available in more than 3000 centers of BSNL. 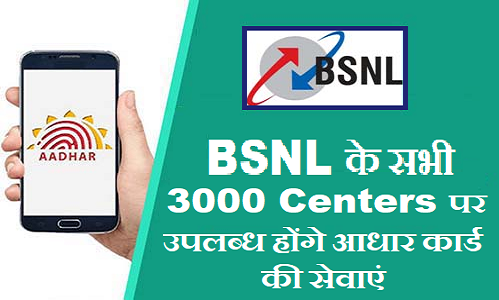 Bharat Sanchar Nigam Ltd (BSNL), which is governed by the Indian government, is soon going to provide facilities like Aadhar card centers, such as creating a new Aadhar card and updating the Aadhar card in more than 3000 centers. Now you will also be able to avail the facilities of the Aadhar by visiting your nearest BSNL Customer Service Center. . In the statement given by Shrivastav, he also told that the process of opening the Aadhaar Center has already been started, the first AADHAR center can be started from January 1. On this, UIDAI CEO Dr Ajay Bhushan Pandey said that more and more centers can be provided more services to more people ", which will make it easier for people to deal with problems related to the AADHAr Card.